An operation manager is one of the important workers of the company who is assigned with the task of planning and coordinating all the operations that take place in an organization. They also participate in training the new employees and contribute in packing and shipping of the products sold by the company. There are always many job opportunities for an operational manager. Whenever a person wants to resign from the post of operations manager, he is required to write the operation manager resignation letter. This letter leaves an impression on the person that stays on the company permanently. So, writing an effective and positive resignation letter is important. The sudden exit of the operation manager can badly affect the company. There should always be a proper way and strategy to leave. Writing the resignation letter is the best strategy since it is used to give the formal notice to the company so that it can perform appropriate transition in the time period specified in the resignation letter. If the person has to leave on an urgent basis, the resignation letter should also provide a solid reason. 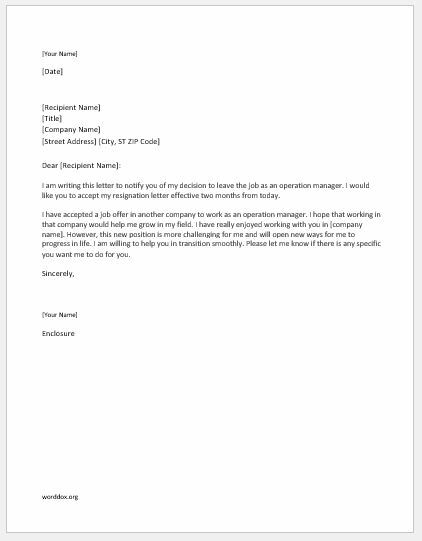 Resignation letter given below can be very helpful for you if you want to write a letter of resignation with positive wordings. I am writing this letter to notify you of my decision to leave the job as an operation manager. I would like you to accept my resignation letter effective two months from today. I have accepted a job offer in another company to work as an operation manager. I hope that working in that company would help me grow in my field. I have really enjoyed working with you in [company name]. However, this new position is more challenging for me and will open new ways for me to progress in life. I am willing to help you in transition smoothly. Please let me know if there is any specific you want me to do for you.